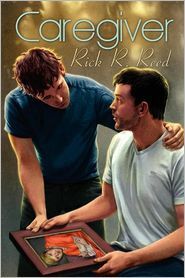 Reed, Rick R. “Caregiver”, Dreamspinner Press, 2011. The AIDS epidemic changed the LGBT community totally and those of us who lived through it remember how it was. Those who were too young need to know how it was back then when people died everyday and groups of friends were wiped out. It was a scary time when going to funerals competed with going out for fun. Reed’s new book is set in 1991 at the height of the epidemic. Dan and Mark have gone south to Florida to get away from the temptations of Chicago and Dan volunteers at the Tampa AIDS Alliance where he meets Adam, a guy full of wit and charm. Adam has AIDS but he refuses to let the disease run his life and take his wit. However, he is not having an easy time with life but manages to keep a somewhat positive outlook. Adam teaches Dan about bouncing back and staying strong. There is a small problem here and that is that Dan is physically attracted to Sullivan, Adam’s lover. He knows that this is wrong but Mark has cheated on him and is really involved with drugs. It seems that Dan sees a better life with Sullivan so he leaves Mark and walks into a situation that could hurt all who are involved. When Adam dies, the two men are both alone and they try to use their love for Adam as a way to love each other. If you have ever read Reed, you know that he is a master of the dark plot and this could be his darkest yet. He takes on AIDS as the focus for this book and he looks at those people who are infected with the disease. It made me remember how it was and how we were gripped with fear as we watched friends die. Here Dan meets Adam at the AIDS Alliance and Adam charms him even though he is wearing a simple black dress and “ever-so-tasteful” pearls. Adam has lesions on his body so Dan realizes that there is no question about his HIV status. He has risen above the disease and Dan is taken in by him so that they become fast friends. Dan knows that his relationship with Mark is dying and Adam and his partner, Sullivan, are having a rough time dealing with Adam’s illness. When Dan meets Sullivan, both men instantly feel the attraction for the other. I really feel that Reed has written this book as a tribute to those who are gone and I am certain that each person who has been touched by loss because of AIDS will find a lot to identify with here. On a personal note for me, I was living in Israel when the epidemic stormed America and we were almost totally untouched by it in the Middle East. I came back to the States on 1990 for a visit during the summer and I quickly realized that things were very different in New Orleans from when I left the city several years before. Every person that I had once counted as a friend had lost his life to AIDS and I suddenly realized the power and menace of the disease. I think what shocked me the most was the number of funerals I attended that summer and the funeral homes were making as much money as the gay bars did. I was afraid to open the newspaper lest I find more friends gone as I glanced over the obituaries. Those of us who survived that horrible time are that much stronger now and we have learned the real meaning of the word “love”. I have read so much about AIDS that I was not sure I could handle another book so I approached Reed’s novel with trepidation and knowing that I would be affected by it from the moment I opened the covers. Once I began, I was pulled into the story and I could not stop reading. There were moments that I wept as I read and I really went through a catharsis by the time I finished the book. The beauty of the book is that it is the story of all of us who lived through that terrible time but we must remember that even though we have the disease under control, our battle with AIDS is not over and every day people are dying from it. This entry was posted in GLBT fiction on November 18, 2011 by Amos.